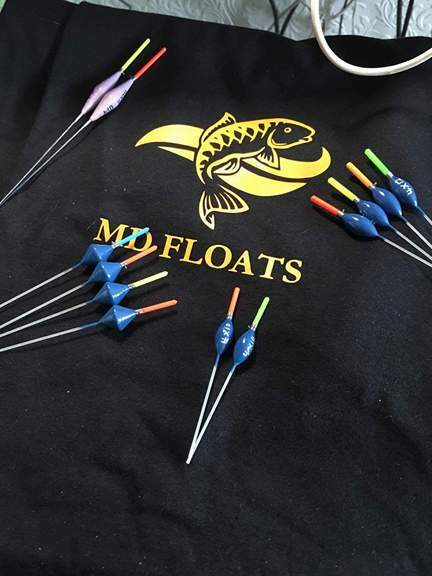 Today i was going to fish Horns dam as a stand in for my mates Jeff’s floats team which was languishing towards the bottom of the winter league and i was also down to fish on the arm section that had produced lots of small silvers with the odd bonus skimmer if you are lucky so with that in mind i had decided to try something a bit different from the norm on here which i will go into more detail later in the blog . After my thirty mile drive up to Preston where the venue was situated i was one of the last to arrive so i hadn’t long to wait before the draw took place and as the team had finished last on the previous round we had the pegs which were left in the bag , my home for the next few hours was going to be peg thirty and this didn’t mean a great deal as i hadn’t seen the lake before but after pushing my gear around to it i found out that it was right at the start of the split so i shouldn’t be too far away from the fish fingers crossed . Six meter line this is what i had been told was the best area to fish with loose feeding by hand the best way to attack it and i set up two rigs for this swim the first was a 4×12 rw maggie float which had an on the drop shotting pattern , the other was a more positive 4×14 rw maggie float which had a bulk+dropper shotting for when the fishing was really good and i also expected it to pick up some bonus fish because it would enable me to produce a static bait , on both rigs i used 0.14 garbo main line with a six-inch length of 009 garbo hook length and elastic was solid size six preston slip . fourteen meter line i hoped that this would be my bonus skimmer line and i fed it with four balls of micros at the start of the match , with the wind being as bad as it was i decided to use a 4×16 malman roob float this would allow me a bit more stability of the rig and i could even put a few inch of line on the deck as i was using the more positive double bulk shotting pattern the main line was my usual 014 garbo and hook length was a three-inch piece of 010 garbo that had a size 16 matrix rigger hook , elastic was the same size six preston slip . 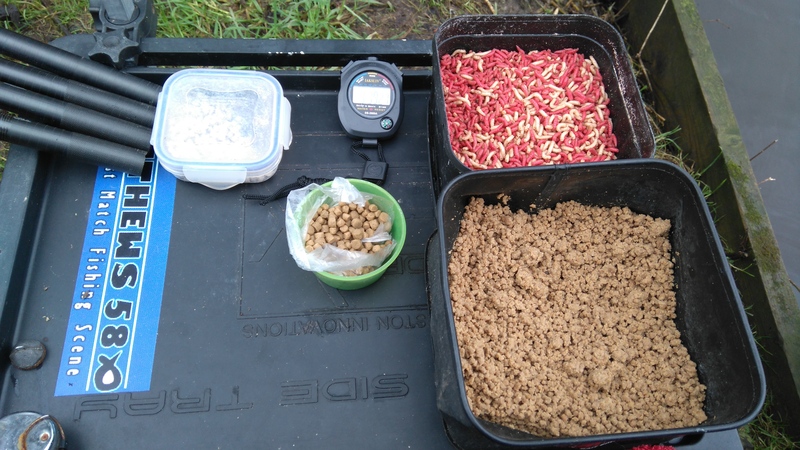 The normal thing to do in here is to feed ground bait at the start of the match but today i decided to use pellets because i felt these would be better for the skimmers so when the all in sounded in the distance i proceeded to put three balls of micros plus one lose cup of micros on to my long pole line and i wanted to leave it for as long as possible as this would allow the skimmers to settle a lot better , i then started my match on my top six swim with my on the drop rig i began feeding through a large kinder pot trickling a few maggots in constantly and when the wind allowed i would lose feed a dozen by hand , i kept letting my rig fall through the water with the feed but a bite less twenty minutes wasn’t what i expected especially as it was supposed to be a small fish race and the other anglers on the opposite bank where also catching quite well although they did look like they was fishing further out than me , so with not a lot happening on my original line i decided to put another section on the pole and after plumbing up i found it to be the same four-foot deep so i was able to use the same rigs , another bite less twenty minutes had me moving again and this time i put it towards my right which gave me better presentation in the windy conditions yet again it was only a couple of inch shallower but i finally managed to catch a couple of ounce roach in the net although i was waiting ages for any indications . The first hour passed with only some small roach in the net so i had no other option other than to go on my long line a bit earlier than i wanted , so out i shipped my pole with a 4mm expander on the hook and no sooner than my float settled it slid under with skimmer number one coming to the bank but at 2oz i would need a lot of these to get a double figure net , this swim was producing quite regularly but all were of a similar size or smaller and i didn’t feel my double bulk shotting pattern was correct for fish that size so i changed for a bulk + two droppers this worked a lot better and i had a good run of ten in forty minutes . With the wind increasing steadily i was really struggling to present a static bait which is necessary when using pellets so i decided to change my hook length to a six-inch length of 009 which had a size 18 matrix silver fish-hook attached this would allow me to use double maggot on the hook i hoped this would attract a bigger stamp of fish and also allow me to lay a bit more line on the deck , my change of tactics didn’t really work out as i had planned because the size of fish remained the same but i was now missing a lot more bites and bumping the odd fish off as i shipped in so another change of hook length to a size twenty matrix silver fish-hook was called for this sorted the problem as i began hitting a lot more indications . With conditions not improving any i had a look on my top six swims but they failed to produce a single fish so i had no other option but to fight the wind at 14m and catch anything i could , the lads within view on the opposite bank had slowed down there catch rate but mine was getting better all the time the only trouble was the only two bonus fish i hooked both fell off moments after the strike which was not what i wanted or could explain ! ! It was soon time for the all out and i had managed a grand total of sixty fish i was unsure of my weight but figured i had about three pounds which i was told had been enough for good section points in previous rounds , as the scales reached my peg i was the last to weigh in and it seemed that the arm had fished a lot better than people had thought it would with 11lb winning , 9lb second then a couple of 6lb nets and my fish went 4lb 8oz which was good enough for fifth in the section . If i had been able to catch on my six meter line or not had that blank hour i could have probably reached 6lb or more if you factor a couple of bonus skimmers into the equation , overall the match was won with 18lb and 15lb came second . The team had one last in section , two fifths in section and one first in section which gave us 19 points , fifth overall on the day i think this is their best result so far and also lifts them up off the bottom with one round remaining , on a personal note i have stood in twice for the team and managed two fifth positions not the best of returns but to be honest i have struggled to get too grips with this style of fishing . 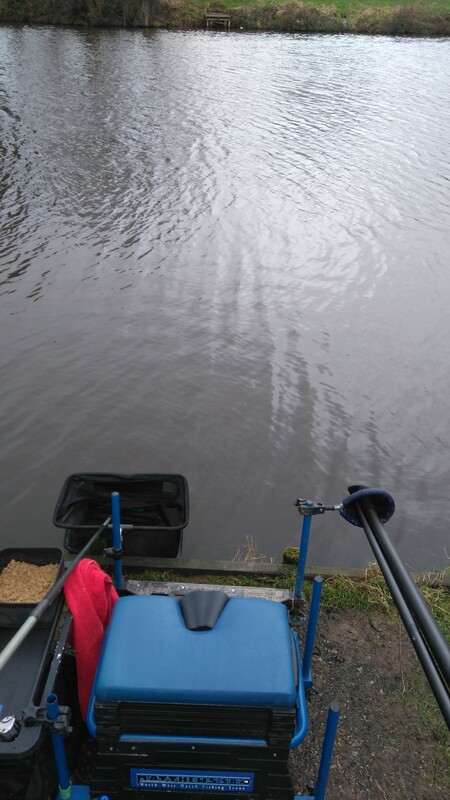 My next match is the last round of the winter league at Old Hough were im in joint third place only a couple of points behind the leader so it’s still all to play for , i just need a peg with a chance of catching a few fish and i should be fine . After that i think i might have a look at doing some f1 fishing because it seems like an age since i last caught any so , Partridge lakes ,Cunneries or Bradshaw’s will be on my agenda before my busy Spring , Summer and Autumn campaign . 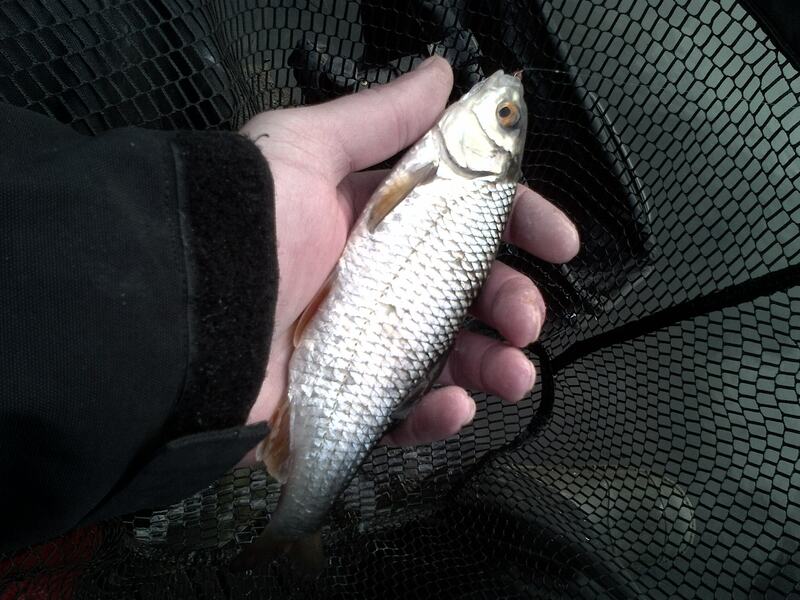 This entry was posted in Horns dam, horns dam winter league and tagged Coarse fishing, Common roach, f1 fishing, Fish, Fishing bait, garbo line, Horns dam, horns dam winter league, Lake, Maggot, malman roob, matthews580, Old hough fishery, Outdoors, Recreation, RW maggie float, silver fish fishing. Bookmark the permalink.